You need a holiday occasionally. Everyone does. Let's say you set up your TutorTube account such that students pay you automatically every week. But what about the week you're on holiday? 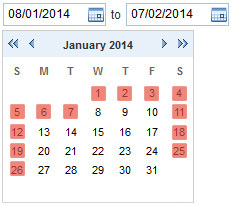 In your TutorTube Easy Admin panel, you simply mark on a calendar the days you are working and the days you are not working, like this. Then, where lesson appointents are booked on the remaining work days, lesson payments will automatically happen for you.